This article originally appeared in The Greenwood Tree, the journal of the Somerset and Dorset Family History Society, November 2014. It is reproduced here with the agreement of the Editor. For information about the Society, visit www.sdfhs.org. While we can usually find out a lot about our ancestors’ lives and occupations, information about their health is fairly rare. For many of us, the most we know is what’s on a death certificate or, perhaps, a late census might record that they were blind or deaf and dumb. Very few hospital records have been published and hospital archives in record offices are seldom indexed. For those with Dorset research interests this could change. 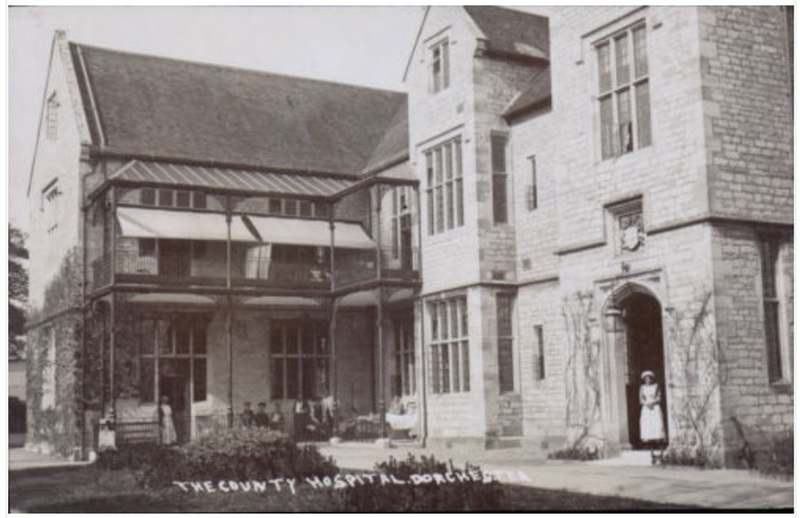 I have set up a website dedicated to the history of Dorset County Hospital up to the time it became part of the National Health Service, and I am publishing partial transcripts of patient admission registers. Transcription of the earliest surviving in-patient register – covering 1847-59 – has already been completed and contains over 3,500 entries. Dorset County Hospital was established in 1840 and the first in-patients were admitted in May 1841. The hospital had its origins in a number of public meetings in 1838-39 called by local MPs, magistrates and businessmen. This was one of the last counties to have its own hospital: the nearest infirmaries (at Salisbury, Exeter and Winchester) had all been founded in the previous century. The building and running of the hospital were paid for by “governors” – wealthy individuals who paid subscriptions and donations. The better-off classes did not use the hospital – if you could afford it, you were treated privately at home. The hospital they funded was for the people who worked for them. The desire was to create “an enduring principle of gratitude and thankfulness to the superior classes from the labouring community,” whose work made them “more liable to the attacks of disease and the casualties of life”. Dorset County Hospital remained a voluntary hospital, run on a charitable basis, until it was taken over by the National Health Service in 1948. To obtain the “lines” the woman or her friends had to discover who the governors were and their addresses; some hospitals supplied lists, others did not; apparently the woman worked by local hearsay, with the consequence that some governors complained of being plagued and others chose to give out-of-town addresses. Whatever the outcome, the woman could not escape much walking and humble waiting. (The People’s Health 1830-1910, 1970, p. 30). The workless and the friendless, without a governor to nominate them, had to rely on overcrowded workhouse infirmaries if hospital treatment was needed. In 1844, one former workhouse medical officer complained that the county hospital would only take curable cases that did them credit. The original hospital building was designed by Benjamin Ferrey (1810–80) and it still stands in Somerleigh Road, in the centre of Dorchester (it is now a block of apartments). Ferrey was the youngest son of a draper who became Mayor of Christchurch, and he studied architecture under Augustus Charles Pugin. Ferrey’s design – a central block with two wings either side of a courtyard – allowed for the building to be erected in sections as funds allowed. The north wing was built first (1841), next the central portion (1845) and finally the south wing (1859). Over this time, the number of beds rose from 20 when the hospital opened to 60. Demand for beds increased particularly in the 1840s and 1850s when the hospital treated a significant number of workers involved in horrendous accidents while constructing the local railway. In 1845 William Cole was employed on the Southampton and Dorchester railway, near Moreton, when a waggon “caught him by the shoulder, knocked him down, and six waggons laden with earth passed over both legs, completely crushing them”. He died within hours. In 1846 Henry England, aged about 18, also died after a cart crushed his legs while working on the Southampton and Dorchester line near Wareham. A similar fate befell 22-year-old John Mellish in 1848 who was employed at Poundbury on the works of the Wilts, Somerset and Weymouth railway. In 1857, George Whittaker, “a steady, industrious man” lingered for nearly a month before succumbing to injuries sustained during the construction of the line at Maiden Newton. A total of 48 railway “navvies” appear in the first in-patient register. Since its opening the hospital has always treated more out-patients than in-patients. By 1900, there had been nearly 29,000 out-patient admissions, compared to 17,500 admitted to the wards. These patients were not just Dorset residents: in the early records there are individuals from Somerset, Devon, Hampshire, and even further afield. The building of the railways bought labourers into Dorset from other counties. William Cole, mentioned earlier, came from Hatfield Peverel in Essex. The unfortunate George Whittaker came from Brompton near Northallerton in Yorkshire. The website also contains information about the hospital’s staff. The first employees were just a house surgeon (who was an apothecary), a matron and a small handful of nurses and domestic servants. Initially, the nurses were untrained and even by the early 1860s the only requirement was that applicants were “respectable” and aged over thirty, although the hospital was also beginning to employ nurses trained in Florence Nightingale’s methods. The house surgeon was a young man – in his very early twenties – who had just qualified. Usually he remained in post for two or three years before securing another position, but in 1867 two successive house surgeons – Alfred Ensor and William James Bennett, both sons of Dorchester families – died suddenly in post. It was dangerous for the nurses too: in 1858 two came down with scarlet fever caught from a patient who subsequently died. The medical experience and expertise was provided by local physicians and surgeons on a consulting basis. They were unpaid, but undertook the work for its prestige and for the opportunity to build their private practice through contact with wealthy hospital patrons. Hospital work also provided opportunities for research: the patients, as objects of charity, were obliged to submit to clinical experimentation (which was banned from the workhouse infirmaries). In January 1848, surgeon William Denning Tapp removed a 2¼lb tumour from Eliza Satchell, a labourer’s wife from Langton Herring, who was anaesthetised with chloroform, just three months after its medical use had first been discovered. If the patients were like Anna Dare, a 35-year-old washerwoman, they were discharged for refusing treatment. Dare, described as “nervous”, was admitted in 1859 for facial neuralgia, but after injections of morphia into her neck, she refused further doses. The hospital’s patrons included “the great and the good” of the county who sat on the managing committee. I am beginning to publish notes from the committee’s minutes. These detail staff changes, such as the sacking of porter John Phelps in 1852 for “improper conduct” or the dismissal of another porter, David Phelps (perhaps a relation), the following year, for failing to fulfil a promise of marriage to a girl in the town. Other unusual occurrences were recorded, for instance the discharge of patients Alfred Pearce, Robert Stickland and Charles Parker for drunkenness in 1852, and an out-break of erysipelas requiring the wards to be fumigated and whitewashed. The mainstay of support for the hospital came from the annual subscribers, who included poets William Barnes and, later, Thomas Hardy (who opened the hospital’s fundraising fete in 1921). Details of over 2,500 subscription payments from 1838 to 1901 are currently on the website. Subscribers were mostly from Dorset, but some were from London, Bath and other cities. The site will be most useful for what the records tell us about the thousands of working poor treated by the hospital, especially those elusive “ag labs” whose lives were otherwise barely recorded. New material is being added all the time and all the records transcribed can be consulted at the Dorset History Centre. You can access the website at http://www.historydch.com and receive updates on progress by following the Twitter account @historydch. You can make contact via the website email address, historydch@aol.com. The website is non-commercial and free to access. It has no official connection with the modern Dorset County Hospital NHS trust.